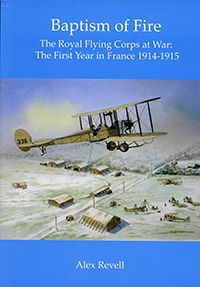 Baptism of Fire details the vitally important role played by the Royal Flying Corps in the first year of the war of 1914-1918: its pioneering of aerial reconnaissance, both visual and photographic; the essential, all important work of ranging for the artillery, and its ultimate development into a highly effective and important arm of the British Army. It is also the personal story of the courage of young airmen whose underpowered machines lacked the ability to climb to a height sufficient to protect them from both anti-aircraft fire and small arms fire from the ground. Young men, who daily – weather permitting – in infantry terms, went ‘over the top’ every day to face the fire and shock of the enemy. There are six maps and three appendices. Appendix I: The departure of the RFC to France in August 1914: a listing of the men and aeroplanes, types and serial numbers that flew to France on 13 August 1914 plus those men and machines that went by sea. 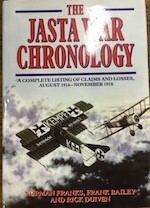 Appendix II: The aeroplanes, by type and serial numbers, used by the RFC in 1914-1915, including those purchased from the French. Appendix III: Casualties: August 1914 – August 1915. There are extensive chapter notes; selected biographies of prominent people; a bibliography, and an index.